Updated 2013-08-03: Details of Hattie’s death and burial have been revised. Incorrect details have been left in, but stricken out, and revisions are highlighted in blue. I received this photo from my grandmother, Harriet (Askew) Prettyman a few years back and it’s one of my favorite family photos. I love the way the edge of the painted backdrop can be clearly seen on the left side of the photo, and that the bottom of the backdrop sits rumpled on the floor, visible in the gap between a child’s arm and his torso. The backless, single-armed chair upon which the father sits contributes only briefly to the verisimilitude of the family sitting casually in their living room. The sad potted plants that appear to have surrendered all dignity complete the scene. All of this stands in stark contrast to the proud, grounded, and solidly built family that is the subject of the photo. Compositional details aside, this photo is tragic in many ways. It documents a family together for perhaps the last time. It speaks to the effects that death can have on a family. It also serves as an example of how the decisions we make about where to live and where to work can have large and unintended consequences. There are six people pictured in this family photo: Wilfred Lawson Askew, Hattie (Eddy) Askew, Clyde Lawson Askew, Manfred Eddy Askew, Beulah Lucille (Askew) Fanson, and Kenneth Hubert Eddy. I’ll start with the baby in her mother’s lap, Beulah Lucille Askew, as she presents clear evidence regarding the date of the photo. Beulah Lucille was born on May 20, 1907. In this photo, she’s certainly less than a year old. From the standard lists of infant milestones, she looks to be about three to five months old — she is clutching her own hands, has good head control, holds her head up when sitting, and is old enough to sit up with some support, but not yet old enough to sit up without support. If this 3-to-5-month-old estimate is correct, then the photograph was taken between late August and late October, 1907. Given her young age in this photo, I won’t go into much more detail than I already have on Beulah Lucille. Harriet S. “Hattie” (Eddy) Askew is seated at the right of the photo. She is the wife of Wilfred and the biological mother of Clyde, Manfred, and Lucille. As I mentioned in an earlier post about Hattie, Hattie Eddy Askew lived a short life, dying in her early thirties (32-34), only one to two and a half years after this photo was taken. She died in Cripple Creek, Colorado, at their farm home outside Casselton, North Dakota, around 1908-1910† on February 14, 1909. She died of pneumonia as a result of a sudden and unexpected heart failure following an illness of about a week’s duration. Her husband Wilfred could not handle the burden of raising his children alone, so Clyde, Manfred, and Lucille were sent to live with Hattie’s then-childless younger sister Mattie and her husband Addison Stewart in Dieringer, Pierce County, Washington. Another of their maternal aunts, Beulah Eddy (Lucille’s namesake), then 20 years old, also went to live with Mattie, Addison and the three children, presumably to help with the large and unexpected burden of three young children. Sending the three Askew children to live with a then-childless couple half a continent away may seem on its face to have been an odd decision, but with some additional context, it may make more sense. The Eddy family had been hit hard by death by the time of Hattie’s early demise in ca. 1908-1910. Hattie died young, and so her mother Emma Alice (Comstock) Eddy, who had raised seven children of her own, would have been an obvious choice to adopt her grandchildren with her husband Chester. But Emma herself had died prematurely in 1907, at age 56, in Tacoma, Washington. Hattie’s eldest sister, Emma Addie Eddy, had also died young, passing away in 1887 at the age of 19 and leaving a 1-year-old daughter Myrtle E. and a widowed husband, George Herbert Craig. The next-eldest Eddy child, George Frank Eddy, also died prematurely in 1893, at age 23, and he also left a young child behind, Josephine Eddy, only 4 years old at the time of her father’s death. The next Eddy child in line, the third-born Hiram Hubert “Bert” Eddy, had also died prematurely, dying in November, 1902, while away from home working in Dunsmuir, Siskiyou County, California. He also left behind a young child, Kenneth Hubert Eddy (pictured in this photo), who was only 15 months old when his father died. Kenneth’s mother died around the time this photo was taken, and Kenneth had been adopted into WIlfred and Hattie’s family. So at the time the photo above was taken, the middle child, the fourth-born Hattie, was the eldest Eddy child. With her death, her sister Mattie was then the eldest surviving Eddy child. There were two younger Eddy children: Gladdie and Beulah. From what I can tell, Gladdie died quite young, so Mattie and Beulah were the only two surviving children of a once-large family of seven children. It is in this context that it makes perfect sense that Mattie would be the best candidate to adopt the Askew children, and why Beulah would choose to join her only surviving sibling in raising their shared nephews and niece. † The exact date of Hattie’s death is currently uncertain (ca. 1908–1910). Harriet (Askew) Prettyman once told me that Hattie died around 1908, but I also discovered a note written by Harriet’s now-deceased aunt, Eva Scott Martes—the sister-in-law of Hattie’s eldest child, Clyde—stating that Hattie died in 1911. However, as Hattie’s children were already living with their aunt and uncle, Martha Alice “Mattie” (Eddy) Stewart and Robert Addison Stewart at the time of the 1910 census (enumerated on May 4-6, 1910), Hattie had most likely already died by May, 1910. Wilfred is seated at the back center of the photo. He is the husband of Hattie, the biological father of Clyde, Manfred, and Lucille, and the presumed adoptive father of Kenneth. Wilfred was born on July 15, 1873, in Cumberland, England, probably in the parish of Egremont, where the Askew family had lived for centuries. He was the fifth child and second son of Col. Joseph Askew and Jane (Eilbeck) Askew, part of a family that would ultimately grow to include 13 children, 12 of whom lived to adulthood. In early 1875, three or four months before his second birthday, Wilfred and his family departed from Liverpool on a ship called “City of Montreal”, bound for America. He arrived in the Port of New York on March 20, 1875, and by 1880 he and his family were settled in Wadena, Minnesota. I currently have little information on his activities or whereabouts from 1880 to 1900, but he was still living in Minnesota on May 7, 1896, when his son Clyde Lawson Askew was born in the nearby city of Menahga, Minnesota. 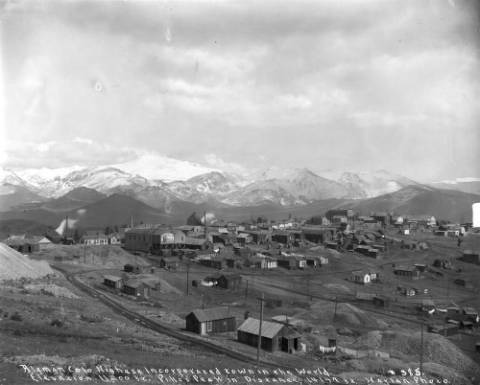 At some point between May, 1896, and March, 1900, Wilfred decided to take his family and move from Wadena County, Minnesota, to the mining town of Altman, Teller County, Colorado. 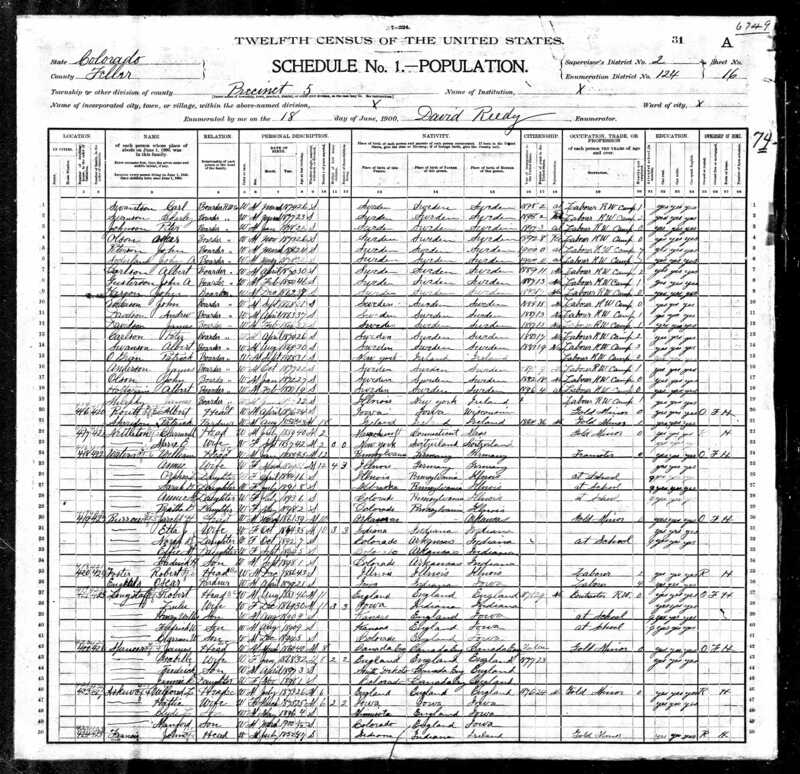 The 1900 federal census (pictured at right), enumerated on June 18, 1900, has him already settled in Altman, CO, and Wilfred’s second-born son Manfred is listed as having been born a little over two months earlier in Cripple Creek, Colorado, in March, 1900. Why did he move to Altman? The census entry pictured above gives us a pretty clear picture — his occupation (and that of many others on the same census page) was listed as gold miner. The town of Altman is now a ghost town. It was a short-lived town—it was founded in the late 1800s and then most of the town was destroyed by fire on May 24, 1903. The town continued for a while, though, and Altman was still reported to have a population of 145 in 1914. 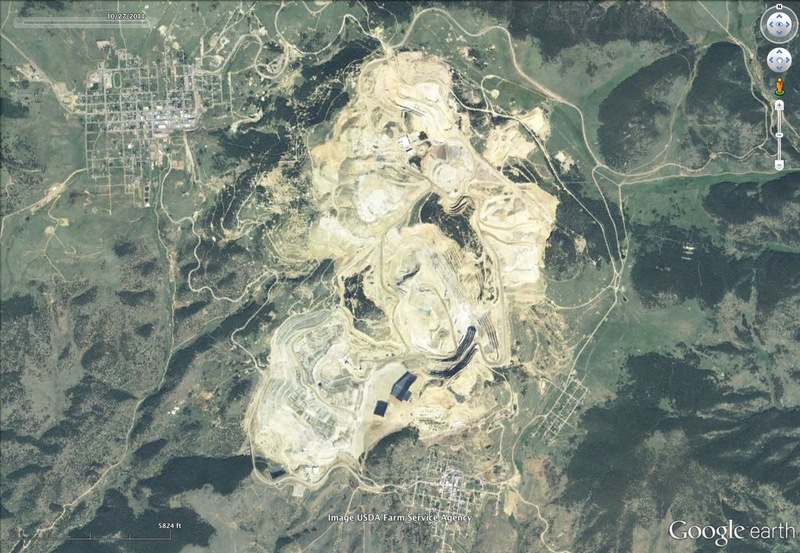 According to its entry in the USGS’s Geographic Names Information System, at an elevation alternately cited as 11,146 feet, 11,200 feet, 10,550 feet, 10,650 feet, or 10,630 feet, Altman was said to be the highest incorporated town in North America. Why the wide discrepancies in elevation estimates? Well, with changes in mining technology, Altman has gone from being a mining town to being a town that itself has now become the mine. 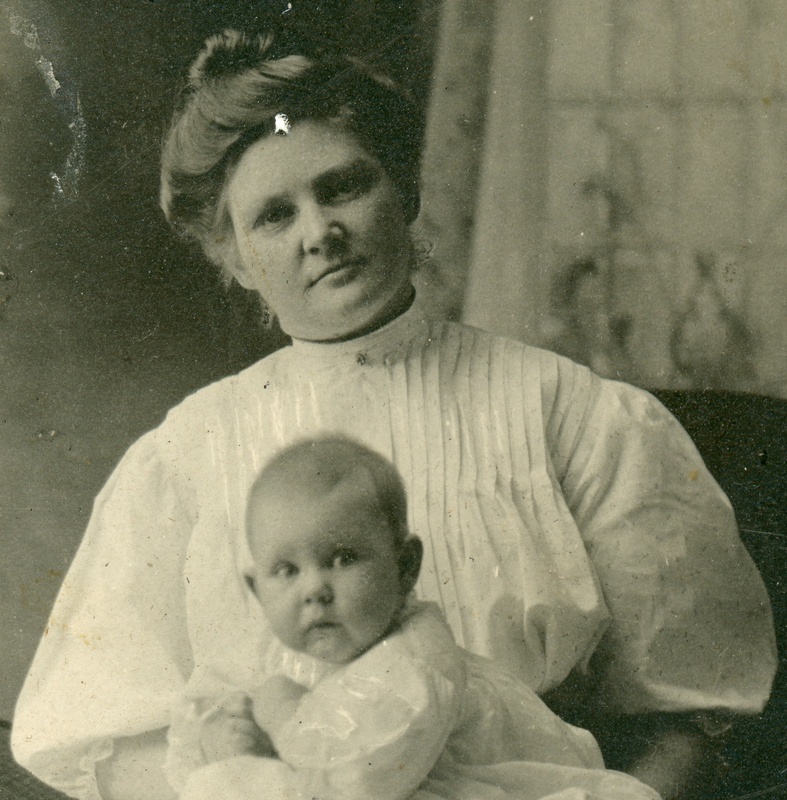 After Wilfred and Hattie moved to Altman with Clyde around 1897-1899, the couple had one other child, Beulah Lucille Askew, who was born on May 20, 1907, in Wadena, MN. From that fact alone, I might have concluded would assume that they had moved back to Wadena by 1907. However, the story I’ve been told about Hattie’s death is that she caught pneumonia while on a trip to Colorado. This is backed up by the fact that she’s buried just downhill from Altman, in Cripple Creek, CO. Why would she have been travelling back to this small, unsavory, mining town, unless they (or at least Wilfred) still lived there? For now, I’ll assume that Wilfred and Hattie lived in Altman, at least part time, for the decade between their arrival in ca. 1897-1899 until Hattie’s death in ca. 1908-1910. After Hattie’s death, Kenneth went to live with his mother and grandparents in Wadena, and the three Askew children were sent to live in Washington with their aunts and uncle, presumably after first travelling back to Wadena. Wilfred himself probably also went back to Wadena, MN, at this point. I say this because he was remarried on April 6, 1911, in Wadena, MN, and the woman he married, Selma Throndson, worked as the “Dining Room Girl” at his father’s hotel in Wadena, the Commercial Hotel. I presume he met her while she was working at the hotel. Wilfred and Selma went on to have five children together: Alma Josephine, Wilfred Russell, Mildred Loraine, William Leighton, and John Gordon “Gordy” Askew. From their dates and places of birth, Wilfred and Selma appear to have lived in Wadena until at least 1916, then moved to Washburn, McLean County, North Dakota, around 1916-1918, where Wilfred was the foreman of a road building crew††. By 1921, Wilfred and Selma were back in Wadena. †† Aside: I’m really excited to look into this, as my previous post was about a road building project in Washburn, ND, that Frank Scott worked on. It seems not at all unlikely that these two men, who would become in-laws when their respective children—Clyde Askew and Gertrude Scott—married each other on May 7, 1916, worked on the same remote road project together. Clyde is the boy on the left of the photo. Clyde was the eldest child of Wilfred and Hattie, and was born on May 7, 1896, in Menahga, Wadena County, Minnesota. 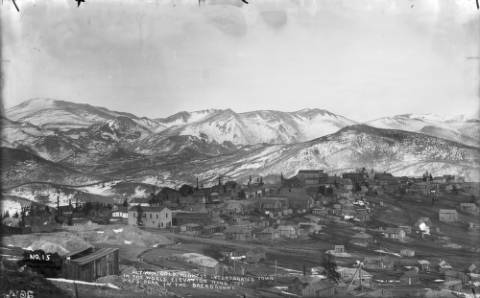 Within a few years of his birth, his father moved the family to the mining town of Altman, Colorado. According to Harriet Prettyman, at some point, Clyde ran away from his adoptive family in Washington and made his way back to Minnesota to ask his father if he could live with him and his new wife. Apparently, his adoptive parents were fiercely religious evangelical Christians, and he didn’t like living with them. I have a lot to learn about Clyde’s early years, but I know that Clyde met his future wife when she was working in the Arlington Hotel in Menagha (Clyde’s grandfather, Col. Joseph Askew, owned and built the Arlington Hotel). Gert and Clyde got married in Menahga on May 7, 1916, and had five children together, eventually settling in the San Francisco Bay Area of California. I’ll do Clyde more justice in a future post. 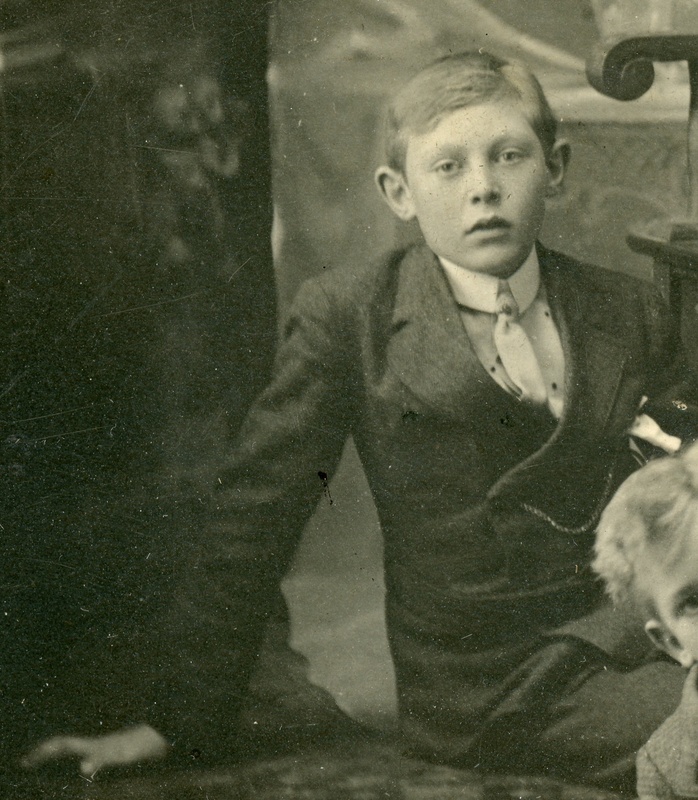 Manfred is the boy at the center of the photo, seated below his father. Unlike his older brother Clyde, Manfred stayed with his adoptive parents a bit longer (although he frequently travelled back to see his Minnesota family) and became a devoutly religious person himself, eventually becoming a reverend. He married a woman named Hope Minerva Purvis and they served together as missionaries in Japan for nearly 20 years—from 1951 to 1969. Time allowing, I’ll find out more about Manfred and write a post about him. For now, I’ll leave you with a photo of him and his wife on their 30th wedding anniversary. 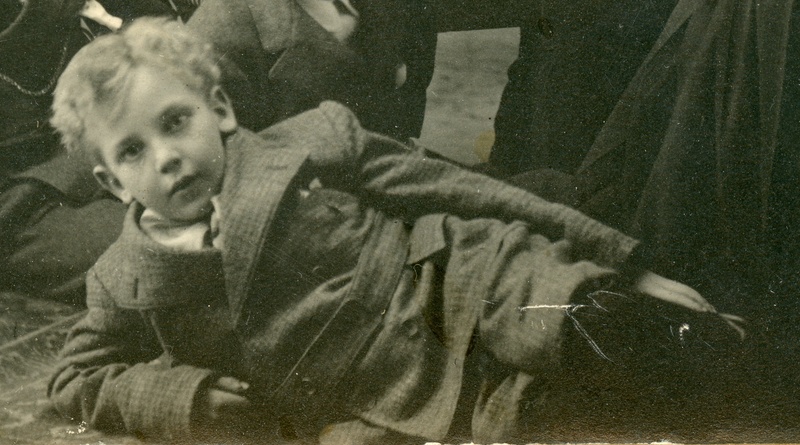 Kenneth is the boy at the front of the photo, reclining on his elbow. After Kenneth was born, his father Hiram “Bert” Eddy set out for the wooded, hillside town of Dunsmuir, California, to make money as a drayer. I do not yet know the specifics, but Bert died and was buried in Dunsmuir in November, 1902, leaving Kenneth and his mother, May Isabelle (Claydon) Eddy alone in Wadena, Minnesota. The family portrait that is the topic of this post would seem to suggest that Kenneth was living with the Askews at the time the photo was taken. By the time of the 1910 census, enumerated on April 26, 1910, Kenneth and his mother (and curiously, another child named Warren C. Eddy) were living with her parents, Frederic and Harriet Claydon, in Wadena. 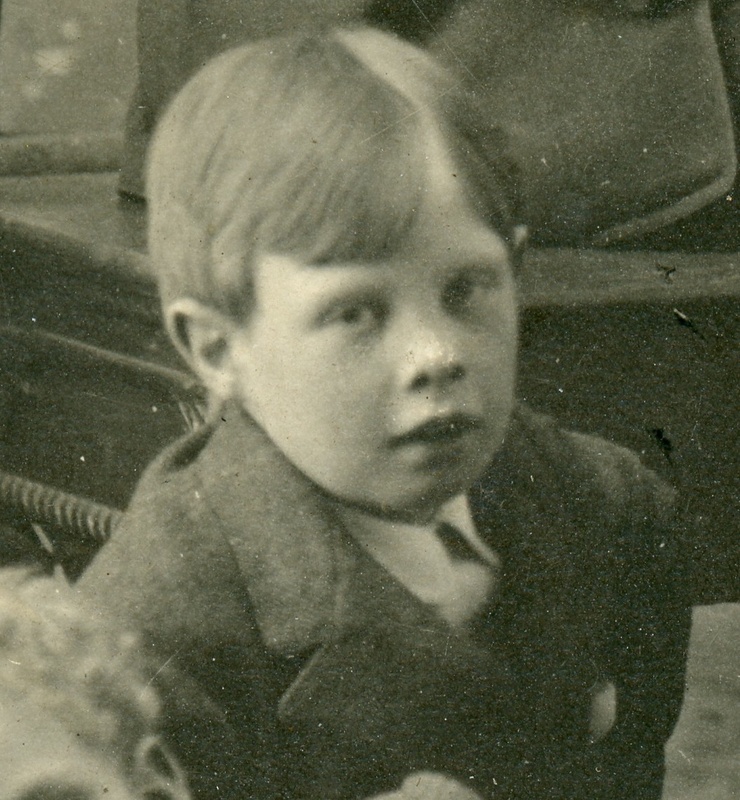 Kenneth’s mother died in 1912, leaving him an orphan. By the time of the 1920 census, Kenneth was living on his own as a boarder in a hotel in Cass Lake, Cass County, MN, and was employed as a clerk in a drug store. He went on to marry Mae Loretta Wright, have four children, and spent the rest of his life in Minnesota until his death in Hastings, MN, on March 3, 1977. This entry was posted in 1900s, Clyde L. Askew, Eddy, Kenneth, Hattie Eddy, Lucille F. Askew, Manfred Askew, Wilfred L. Askew by Michael. Bookmark the permalink. 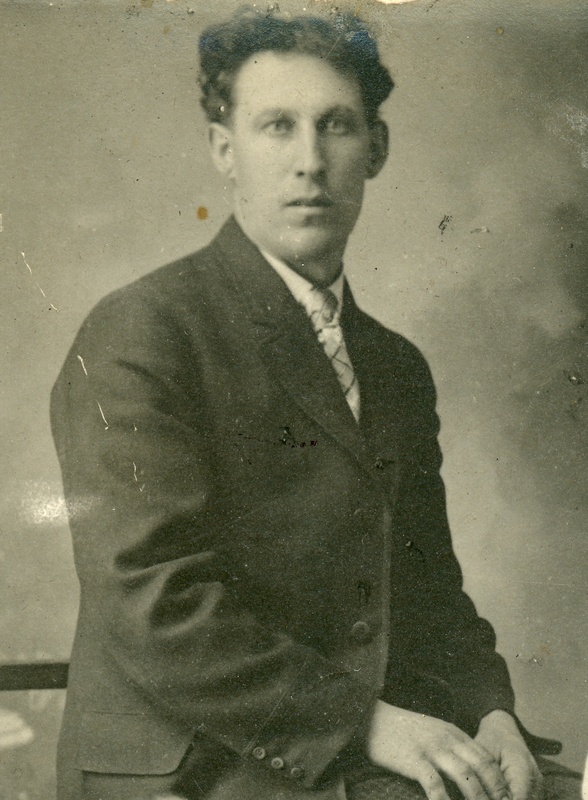 With regard to when Wilfred and Selma Askew moved back to Wadena it may have been in 1921 as you state but it would be very late in 1921 since my father, John Gordon Askew, was born in Casselton ND on June 24, 1921. It was my understanding from talking with my father John “Gordy” Askew they lived on Wilfred Askew’s farm just outside of Casselton ND, about a mile East of Casselton within sight of the old Northern Pacific main line. Wilfred Askew was farming a section of land along with his brothers Samuel “Sam” and William “Will” Askew who also each had a section of land in an area called the “Bonanza Farms” because the soil was so productive. Wilfred and Sam Askew lost their farms in the drought and grasshopper infestation of the 20’s but Will Askew held on and his family still owns land there today. I will try to talk to Dad about this but I think they stayed in Casselton past 1921. I have heard talk of Wilfred, Sam and maybe Clyde being involved in road building in ND all the way to the MT border in Beach ND to include the Washburn area. I do not have a clear idea of whether this was at the same time as they were farming or after they lost the Casselton farms. The Wilfred and Sam Askew farms were sold to the Delrumpel family, [I’m not sure of the spelling but they still own land in the Casselton area]. I also think the Casselton area is where the buggy accident occured that led to the death of Joseph Askew my great grandfather. I’ll try to clarify this when I see Dad next week. I corresponded with and gave information to the genealogists who did research in Wadena many years back, on condition they share what they compiled on the Askew family. They sent me a file which I have saved and will share with whomever would like to have it. That’s enough for tonight… I may be reached at ruth@sandyranch.com. Above you state that Hattie & Wilfred had one other child, Lucile, but my dad was their second child – born in Cripple Creek, CO. He did not stay with his adoptive parents when he got old enough, he often traveled to MN. to be with family there. AND, he and my mother were missionaries to Japan, from 1951 – 1969, never South America. Sorry for not having yet responded to your email of a week ago; I got an unusual amount of family history email last week and I’m working my way through it. Thanks for correcting me on the mistake about South America — I’ll fix that momentarily. What I meant to convey about your dad was that while Clyde took off at the first chance possible, Manfred gave his adoptive parents a chance and stayed longer. That’s the story I heard from my grandmother, but the documents I’ve been able to find show that both Clyde and Manfred were still in Dierenger, WA, in May 1910, and they were both back with their father by 1917 (Clyde) or 1918 (Manfred). Can you tell me any more details about their stay with the Stewarts? William Askew was my great great grandpa. We are still farming that section and live on the farm east of Casselton. I will be the 5th generation farming it after, my father Jeffrey, grandfather Clifford, great grandfather Joseph, and great great grandfather William. Pleased to make your acquaintance. Thanks for the info on your Askew line; with that I was able to add you into my tree and learn that we’re fourth cousins. One of the posts I’ve got lined up is about your great-great-grandfather William’s tragic death. I’ll bump that up in the to-do list. I’m the daughter of the other Ruth who commented earlier, and granddaughter of Manfred. I have this same family photo framed in my living room, but until now I hadn’t known who the extra child in the photo was. Such hard lives these people lived, and so much death! We take a lot for granted these days. I stumbled across your website whilst researching the Claydon family of Minnesota. I have compiled a spreadsheet timeline which includes mentions of the Eddy family. I can let you have a copy if you’re interested. Sorry for the delay in responding. I’d very much like to see the timeline you compiled. I’ll send you an email so you can send it via email.